EXCELLENT LOCATION!! 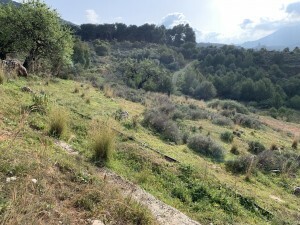 This Finca is situated in a private and quiet area, only 3km from the beach of Fuengirola and all amenities with direct access..
Main house: Entrance hallway, large, spacious living room with a feature fireplace and two sets of double doors providing access to the covered terraces and open terraces. A compact and fully equipped kitchen benefits from a separate laundry room. Distributed via an access corridor, there are four double bedrooms (three with fitted wardrobes) and three bathrooms, of which two are ensuite. There is an additional storeroom. A delightful large porch provides open countryside and sea views. 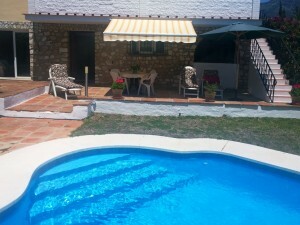 There is also a large sunny terrace which is ideal for entertaining and for barbecues. The property is in very good condition and requires very little renovation to make it your own. There are four hot and cold air conditioning units, double glazed windows and marble floors throughout. The garage, below the main terrace, has been converted into a separate apartment with a living room, kitchenette, 2 bedrooms and bathroom. This has its own covered terrace and an independent access with parking. Exterior: Two driveways, ample parking. Beautiful pool surrounded by sunny terraces with 100% privacy. Beautiful gardens with own well and automatic irrigation system. IBI 1.287,59? per year. Rubbish 134,45? per year. Year Built 1980 (recently renovated).